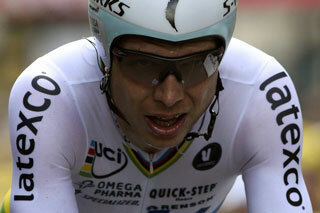 The amazing 2014 Tour de France continued today as Tony Martin won the long 40km time trial, extending his dominance in the TT discipline. Vincenzo Nibali finished a strong fourth, wrapping up his overall GC victory. JC Peraud passed his French countryman Thibot Pinot to end up second, despite two punctures, and Alejandro Valverde failed to gain ground, leaving Pinot on the podium in third and finishing fourth overall (and taking the white jersey as best young rider). Tejay Van Garderen finished fifth for the second time, after barely passing Romain Bardet.